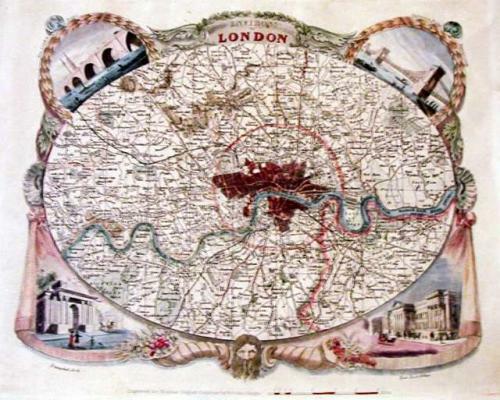 An oval map of London and its (then) environs stretching from Hanwell in the west to Barking in the east, and from Finchley in the north to Norwood in the south. This map is based on Bingley's map of 1828 (see Howgego 315). In contemporary colour the map is surrounded by an ornamental border showing architectural views in the four corners: Hammersmith Suspension Bridge - completed in 1827, the Triumphal Arch - completed in 1828, the New Post Office - completed in 1830 and the New London Bridge - completed in 1831. At the bottom centre is an image of Farther Thames flanked by cornucopia containing fruit and flowers (agriculture), in one, and ivory, pearls, gems and coins (commerce), in the other. This was the last series of decorative county maps produced and was an unusual product in a period when map-makers were rejecting ornamentation in favour of an austere, functional style. In all probability this is the 2nd state of Moule's map of the Environs of London. The 1st state doesn't show the 'London & Greenwich', 'London & Birmingham' and 'London & Southampton' railways. This engraving shows those railway lines and it is probable that the were included on the basis of Parliamentary Enabling Acts (5/1833, 5/1833, 6/1834 respectively) i.e. they were anticipated, since the lines weren't opened till 12/1838, 07/1837 & 05/1838 respectively. The London & Greenwich was the first railway built in London and was built specifically for passenger traffic, it first appeared on a map of London in 1834 (see Howgego 299/8). The map also shows the northern entrance to Thames Tunnel (started 1825, completed 1842) and of St. Katherine's Dock (opened in 1828). This state additionally shows the extent of the 2 penny Post, a 3 mile radius from the New Post Office engraved as a dotted circle. The labels of the districts of Westminster, of London and of Southwark have been re-engraved. At the bottom to the left of the mileage indicator is an inscription, 'Engraved for Moule's English Counties by W. Schmollinger'. Ref: Not in Howgego, Hyde.